If I had my way, I would eat fish every days. If my family had their way, it would be meat. After a couple days of turkey, fish was welcomed with open arms from everyone. Perusing my dear friend and chef Eliane web site, La Serviette Blanche, I came across a recipe that looked fantastic and decided to replicate it. 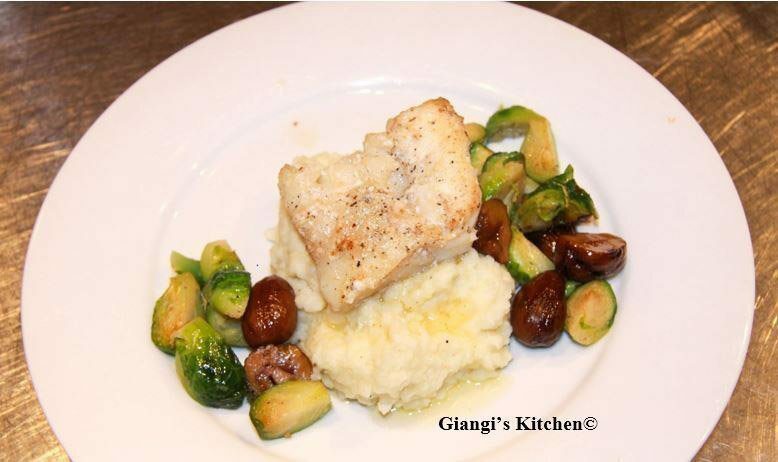 I had just purchased cod and wanted to do something different with my mashed potatoes and the Brussels sprouts. I did not know what to expect when I decided to have cauliflower and mashed potatoes together, and I must admit, and I am addicted to them. A bit thicker texture, but the flavor just delicious. Next time I will process the cauliflower in the blender for a smoother texture. The Brussels spouts I decided to blanch them to shorten the cooking time and to remove the bitterness from them. And who does not like chestnuts? In a large skillet melt the butter over medium heat. Add the pieces of cod, making sure they do not touch. Sauté for 2-3 minutes on each side. Add the wine, cover and continue cooking until all the wine is evaporated.